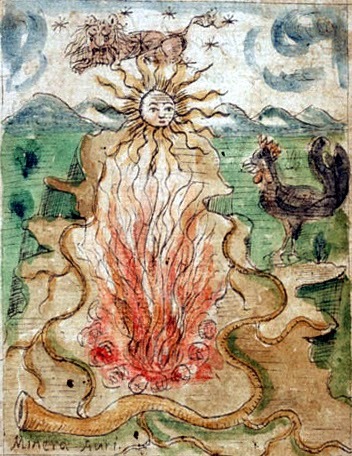 Antonio Neri, "The Mineral Gold"
Tesoro del Mondo, Ferguson 67, f. 5r. As a young man, Antonio Neri faced a decision that had confronted virtually all accomplished artisans since the dawn of time and continues to do so today; whether or not to freely share hard-won technical knowledge with others. The indications are that Neri's thinking on the subject evolved over his lifetime. Testimony given by Florentine metals refiner Guido Melani indicate that as a twenty-year-old, Neri was willing to share his most precious secrets, albeit reluctantly. Melani reported that in July 1596, Neri performed a transmutation of base metal into "twenty-four carat" gold. Upon being pressed, Neri confided that he had learned the secret from a German, who performed the gold transmutation with a "tablet of medicine." The German told him the medicine was nothing but the simple quintessence of green vitriol and the method to produce it was described by Paracelsus. The motivations for keeping techniques secret are obvious; potential monetary reward and personal prestige. Aside from the immediate gratitude of confidants, the motivation for sharing technical secrets can be more subtle; the satisfaction of serving a greater good by advancing the art. It is indeed an ancient and very human dilemma. 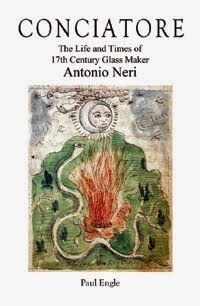 Five centuries before Neri, in the early 1100s a glassmaking Benedictine monk wrote on the subject. In Hesse, Germany, Theophilus Presbyter penned these lines in his De Diversis Artibus [On Various Arts]. "Do not hide His [God's] gifts in the purse of envy, nor conceal them in the storeroom of a selfish heart" and "Do not hide away the talent given to you by God, but, working and teaching openly and with humility, … faithfully reveal it to those who desire to learn." Although it is doubtful that this particular writing was ever seen by Neri, his access to the most extensive libraries in Italy, along with his knowledge of Latin and the writings of other alchemists ensured a comprehensive understanding of his subject and the politics surrounding it. He [Neri] claimed he had found the secret of making the famous philosopher's stone and it was said he had discovered it among some of his confidants. Some thugs learnt of this and attacked him at night, in order to obtain the secret by force. He shrewdly gave them a certain recipe he had in his pocket and explained the figures written on it, claiming it to be the secret oil required. But that night, Neri left Florence and traveled to various parts of Europe. We must also consider the danger to its possessor if it became known to others and particularly to the princes. For that reason even if someone knows and practices this art, he is obliged to keep it hidden and to conceal it; and I know of what I speak. Neri outlines his fears that such a momentous discovery, if generally known could lead to abuse of power, a collapse of the monetary system, and general chaos in society. In spite of his deep reservations, we see a final glimmer of his innate desire to share. He did, in fact, leave behind his recipe for the philosopher's stone, but in coded, obscure language that has never to this day been deciphered. As he put it: "I wrote the words so strangers will not understand." Galluzzi 1982, p. 53; Grazzini 1983, pp. 214–216. For modern English translation see Theophilus 1979. Inghirami 1841–44, v. 13, pp. 457–458. Grazzini 2012, pp. 329, 356. *This post first appeared here on 6 November 2013.